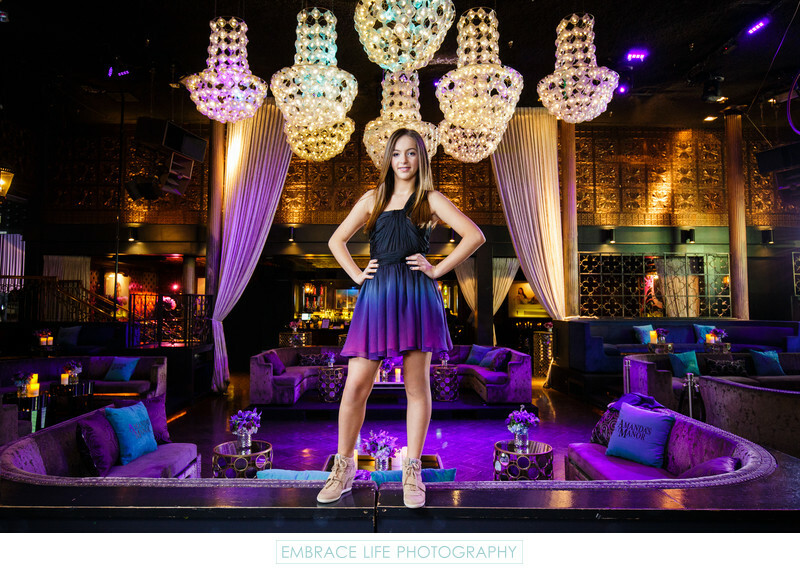 Stunning portrait of the bat mitzvah standing proudly in front of her beautiful reception decor in the Los Angeles night club, Greystone Manor. In the background one can see the event venue's beautiful crystal chandeliers, purple lounge seating with custom printed blue pillows, mirrored tables with purple flower arrangements, dramatic curtains and tasteful lighting, creating a fun, warm and exciting ambiance for the glamorous West Hollywood bat mitzvah party. Keywords: Event Photography (384), Mitzvah (78), Portrait (888).